Last Updated: Mar 29, 2019 @ 10:05 am. The Best Crib Bedding 2019. After comparing and testing more than 60 different bedding sets and sheets, we picked Pinzon as the best crib bedding you can buy. Scroll down for our picks for Best Budget-Friendly Crib Bedding and Best Quick Change Sheets, Best Blankets and Best Play Yard and Bassinet Sheets. New to bedding shopping for baby’s room? Read our 7 Things No One Tells You About Buying Crib Bedding for advice and tips. The best crib bedding needs to be affordable, 100% cotton and high thread count to withstand multiple washings. And for safety, crib sheets should have all-around elastic to say securely on the crib mattress. Pinzon is Amazon’s in-house nursery bedding line and it hits all the right notes: 100% cotton, 300 thread count with elastic around the entire sheet. But the truly impressive thing about these sheets is the price: just Out of stock to $10.99 depending on color and pattern. That’s right, 300 thread count crib sheets for ten bucks. Many other brands cost $30 or more for such quality. Amazon also makes an organic version of their crib sheets, which are GOTS certified. They sell for a mere $12.99 but are only available in six solid colors. We love these crib sheets—Pinzon offers high quality cotton percale 300-thread-count sheets at an amazing price. We purchased a Pinzon crib sheet to test for $9.99. Overall, the sheet has a thicker, heavier feel and that typical “crispness” you expect of percale. When we received our test sheet, it felt a bit waxy out of the box. The sizing (a protective coating on the surface of the sheet’s fibers) gives it a slightly rough feel. To test durability and color fastness, we washed the sheet three times in cold water on the permanent press cycle and dried it on low as per the instructions. Washing instructions and country of origin. We then checked for shrinkage after the last wash. We did experience shrinkage of approximately 3/4″ to 1″ on both sides but the sheet still fit our test crib mattress properly. We measured the sheet when we received it before washing it. This side measured 27.5″. After we washed the sheet three times (following washing instructions) it shrunk between 3/4″ and 1″. The sheet felt rather rough out of the box, and even after the first wash. We recommend washing at least three times before using the sheet. We also used liquid and dryer sheet fabric softeners during the second and third washings. While fabric softener helped, the sheets retained a crisp texture without the waxy feel. Some parents complained they thought the sheets weren’t soft enough, even after several washings. If you’re looking for a softer, fluffier feel, consider flannel (we like Trend Lab’s flannel sheets at $18.19) or jersey knit sheets (AmazonBasics sells a crib sheet made of jersey for $10.49). If you live in a hot climate, percale sheets are typically cooler and more breathable, according to readers. So what’s not to like about Pinzon crib bedding? As of this writing, Amazon just doesn’t sell any coordinating nursery items for the bedding. We’d love to see coordinating wearable blankets and/or regular blankets, crib skirts and decor items. For now, you are on your own. Another complaint: the colors pictured online aren’t quite accurate, complain some of our readers. A few folks got a darker yellow than they expected—this is the peril of computer monitors and color accuracy, unfortunately. In the end, we thought these downsides were minor. Based on our own testing and the comments of parents plus the impressive price, we recommend the Pinzon crib sheets on Amazon.com as our top pick for best crib bedding 2019. Carousel sheets are 200 thread count, 100% cotton and come in some of the cutest patterns out there. They may be expensive, but the quality is impressive. Carousel/Baby Bedding Online, is our choice for runner up best crib bedding. The company used to sell its line of bedding exclusively through retail stores at premium prices. Over a decade ago, however, they decided to change to an Internet-only sales model online at BabyBedding.com (and through Amazon.com as well). Prices are on the higher side: sheets run $39.00 each, but let’s talk quality: Carousel’s sheets are 200 thread count, wash well and have all-around elastic. The site sells all its bedding as separates plus other decor items like matching window valances and lamp shades. Have a desire to outfit a nursery in the colors/logos of your favorite college football team? Yep, they have that too. What if you want to custom design your baby’s bedding? That’s Carousel’s secret sauce. Their website, BabyBedding.com has a cool Nursery Designer tool that allows parents to mix and match any of the patterns and colors available, using drop and drag swatches. For example, let’s say you plan to get a comforter (not for use in a crib, but for play on a floor). You can pick a fabric for the front then a different fabric for the back. Or another color/pattern for the sheets. Or you might like your sheets to come in two or three different patterns. The crib skirt can also be customized. Then you’ll be able to see the final nursery online with all the different patterns and colors. When you pick your first pattern, the site will recommend some solids and patterns that go together—but you can pick anything you like. Prices are similar to Carousel’s ready made designs. Bargain tip: check out Carousel’s “sale” tab, with clearance and sale items at 30% to 50% off. Bottom line: good designs, great quality and affordable prices. 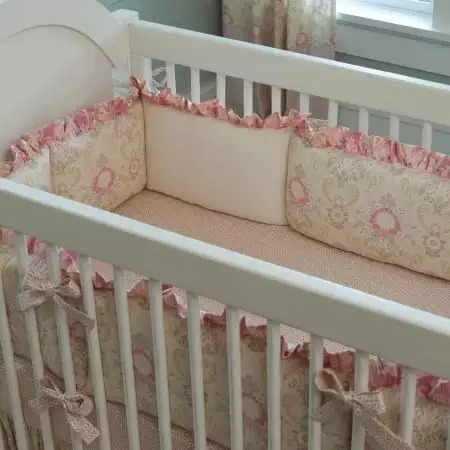 Carousel still displays their sets of crib bedding online with bumpers and blankets draped over a crib rail or teether pads tied to a top rail. While it is still legal in most locales to sell items like bumpers, it would be more socially responsible if Carousel didn’t merchandise these items that way. FYI: Crown Crafts purchased Carousel Designs in 2017 to improve their internet presence as Carousel is an direct-to-consumer-only company. Another great crib sheet option: Aden + Anais makes sheets in cotton muslin, bamboo rayon, organic cotton and cotton flannel. Aden + Anais first came to our attention when we saw their excellent muslin swaddle blankets. Parents love them, so when they expanded into more crib bedding items, we were intrigued. Aden + Anais (A+A) makes crib sheets, blankets, towel/washcloth sets, changing pads and sleep sacks (called sleeping bags). Their classic crib sheets are made of cotton muslin ( $29.95). Previously, the company made organic cotton sheets as well as cotton flannel and rayon (bamboo) sheets. At the time of this writing, it appears only the classic cotton muslin sheets are available. Patterns are simple including leaf prints, dots, stars and dragonflies plus a few solid sheets. A+A don’t offer bumpers (yea! ), but muslin quilted blankets (“dream blankets”) are available in cotton or rayon at Out of stock each (never for use in a crib for a baby under one year of age, in our opinion). What’s the feedback from parents? Universally, A+A is praised for super softness and cute patterns. They wash well too, although we hear a few complaints that some items can snag in the wash. This brand is on the expensive side, especially if you choose the organic cotton option. Like most things baby and organic, there is premium to pay. Bottom line: if you’re looking for super soft, adorable prints, A+A may be the perfect option. 7 Things No One Tells Your About Buying Crib Bedding. If the budget is tight, American Baby crib sheets and set come in a wide range of colors and patterns at impressive prices. Best Budget-Friendly Bedding. American Baby is one of the most affordable brands offering excellent quality 100% cotton percale and jersey sheets. Starting at $14.99 per sheet and going up to about twenty bucks, American Baby makes separates as well as three– and six-piece sets starting for Check on Amazon. They make traditional percale, cotton jersey and chenille sheets. Don’t bother with sets that include bumper pads as we don’t recommend using them (see our 7 Things below for more on bumpers). American Baby makes waterproof mattress pads, changing pad covers, crib rail covers, mini crib and cradle bedding sets. They even have a few organic cotton options. Colors and patterns are basic. Bottom line: our readers like American Baby overall and are happy with the quality and price. We recommend QuickZip sheets—if baby has an accident, zip off the top of the sheet and replace with a fresh one. QuickZip is a great option for those babies that are frequent flyers on the spit-up train. Best Quick Change Sheets. The QuickZip Crib Sheet is our top pick for best quick change sheet. What are quick change sheets? As the name implies, these sheets have a zip-off top layer to make changes quicker. You place it on the mattress like any fitted crib sheet, but if your baby’s diaper leaks in the middle of the night, you don’t have to struggle with removing the sheet and replacing it. Simply zip off the top platform and zip on a clean, dry one. Voila! Minimal hassle. Ok, that convenience comes at a price: the sheets run Out of stock for the sheet with base and $26.99 for just the zip on top. (You buy the whole set and then a few top sheets while dirty ones are in the wash). Also great: Summer Ultimate Crib Sheet, which lays on top off a regular fitted sheet and is snapped to the crib slats. Just unsnap it and replace it with a clean, dry sheet. It’s less expensive than the QuickZip at for two sheets. What’s the difference between the two? Unlike the QuickZip, Summer has a waterproof backing. But we find the QuickZip easier to use than Summer’s snaps. Summer’s Ultimate Crib Sheet is another option for late night bedding changes. It lays on top off a regular fitted sheet and is snapped to the crib slats. Just unsnap it and replace it with a clean, dry sheet. It’s less expensive than the QuickZip at $32 for two sheets. What’s the difference between the two? Unlike the QuickZip, Summer has a waterproof backing. But we find the QuickZip easier to use than Summer’s snaps. Our pick for best play yard sheet is American Baby Company’s 100% cotton knit, fitted play yard sheet, which fits the Graco Pack N Play bassinet/play yard mattress (as well as many other brands). The price is reasonable and they are made of organic cotton. Our top pick for swaddle blanket (also called Swaddles) is the Aden + Anais classic muslin swaddle, in a four pack. Excellent quality and a generous size makes swaddling easy for novices. And they come in cute patterns too! Our pick here is the Halo SleepSack, which practically created the blanket wearing concept. Our favorite version is their all-cotton wearable blanket (for winter babies, there are fleece options as well). If you want a traditional receiving blanket, we recommend Carter’s. These 100% cotton flannel blankets are great to have around the house or throw in the diaper bag. We’ve been rating and reviewing crib bedding since 1994. In addition to checking fabric content, washing instructions, and quality features like all-around elastic, we have extensivly researched how to create safe sleeping spaces for baby. We also evaluate consumer reviews posted on sites like Amazon, as well as our own message boards. We evaluate crib bedding with in-depth inspections, checking models for quality and and safety—for example, testing for washability and softness. We also gather significant reader feedback (our book, Baby Bargains has over 1 million copies in print), tracking crib bedding on quality and durability. After all, if that cute crib sheet falls apart after three washings, why bother? Besides interviewing parents, we also regularly talk with retailers and consumer safety experts to see which brands are most trustworthy and other key quality metrics. 7 Things No One Tells You About Buying Crib Bedding! 1. We DO NOT recommend crib bumpers. Avoid bumpers, especially thick, fluffy ones. Do not use bumpers in your baby’s crib, cradle or bassinet. A landmark investigation by the Chicago Tribune detailed a link between crib bumpers and two dozen infant deaths in the past decade. The article (“Hidden Hazard of Crib Bumpers,” December 12, 2010) prompted the CPSC to open a review of the safety of crib bumpers. An earlier study by a Washington University pediatrician, Dr. Bradley Thach “concluded that 27 babies’ deaths were attributed to bumper pads from 1985 to 2005.” This study, however, has been largely ignored by both the industry and the CPSC, although it prompted the American Academy of Pediatrics to discourage parents from using bumpers. It’s time parents in the U.S. followed similar guidelines. Now we know what you’re thinking: “What if my baby hits his head on the hard wood slats?” or “What if she gets her arm or leg stuck between the slats?” First, these issues are rare—few kids are injured by knocking their heads against the slats and even fewer get limbs stuck. However, there are a couple of bumper alternatives if your little baby decides getting a leg stuck in the crib slats is fun: PURE SAFETY Vertical Crib Liners and BreathableBaby Railguard. Most of these items are either breathable mesh or firm, shock absorbing foam that don’t pose a suffocation risk. Again, most folks will not need these bumper alternatives. The best advice is go without any bumpers in the crib at all. 2. Some crib sheets will shrink in the wash. Check the labels carefully on the sheet or bedding set you’re thinking of buying. If a sheet recommends washing in cold water and line drying, chances are it’s going to shrink. And if it shrinks, it won’t fit the mattress properly. This is a suffocation hazard if the sheet should come off at one of the corners. Once you’ve checked the washing instructions, look for elastic around the bottom of the entire sheet. Cheap sheets only use elastic on the ends. 3. There are several other hallmarks of quality to look for when buying crib bedding. Ruffles should be folded over for double thickness–not a single thickness ruffle with hemmed edge. Colored designs on bedding should be printed or woven into the fabric not stamped on (like a screen printed t-shirt). Make sure the pieces are sewn with cotton/poly thread, not nylon, which can melt and break. Check for tight, smooth stitching on appliqués. If possible, try to buy sheets with a 200 thread count. Frustratingly, most crib sheets do not label thread count, but if you can count the individual threads when looking at a crib sheet up to a light, that’s probably a sheet with a low thread count. 4. You shouldn’t use any soft bedding in baby’s crib. This is an extension of the bumper discussion in Tip #1. 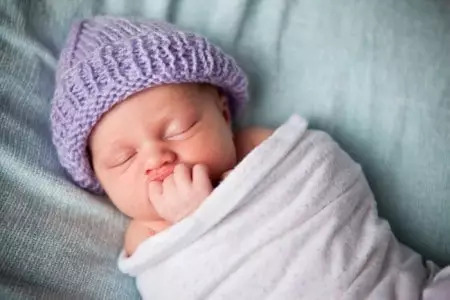 Studies on Sudden Infant Death Syndrome (SIDS, also known as crib death) have linked SIDS to infants sleeping on fluffy bedding, lambskins, or pillows. A pocket can form around the baby’s face if she is placed face down in fluffy bedding, and she can slowly suffocate while breathing in her own carbon dioxide. The best advice: put your infant on her back when she sleeps. And don’t put pillows, comforters or other soft bedding or toys inside a crib. The Consumer Product Safety Commission now recommends that parents not use ANY soft bedding around, on top of, or under baby. If you want to use a blanket, tuck a very thin blanket under the mattress at one end of the crib to keep it from moving around. The blanket should then only come up to baby’s chest. Safest of all: avoid using any blankets in a crib and put baby in a wearable blanket for warmth (see photo below; our wearable blankets recommendation is above). HelpMeGrow.Ohio.gov posts this and other examples of safe sleep habits for parents. One mom wrote to tell us about a scary incident in her nursery. She had left a blanket hanging over the side of the crib when she put her son down for a nap. He managed to pull the blanket down and get wrapped up in it, nearly suffocating. Stories like that convince us that putting any soft bedding in or near a crib is risky. How much bedding is too much? A new father emailed us this question: “With all the waterproof liners, fitted sheets and ultimate crib sheets we’re worried that our firm mattress is now becoming soft and squishy. How many layers are safe?” Good point. We know that some parents figure it is easier to change crib sheets at 2 am if they simply pile on several layers of sheets on the crib mattress. (This way, you simply remove the top wet layer when changing the sheets). While we admire the creative thinking, we suggest NOT doing this. 5. Avoid electric blankets and heating pads. Baby diapers often leak (sorry, fact of life) and an electric blanket or heating pad shouldn’t get wet! Also, overheated babies have a higher risk of SIDS. If your baby seems cold, add an extra layer under her wearable blanket for warmth. Don’t turn the thermostat up over 68° though. A too warm nursery is dangerous. 6. Take care if you are swaddling your baby, you could be wrapping her too tight. It’s fine to wrap your baby’s arms snugly but leave the legs loose enough for him to move them around. Experts advise this technique to possibly prevent hip dislocation from spending hours wrapped like a mummy! And stop swaddling after two months—your baby will need to move around and stretch out after that age. 7. Let’s talk about how much bedding you really need. Start with three to four fitted sheets. This gives you enough for quick changes without doing laundry every day. Next you’ll want a couple waterproof mattress pads (one to use, another spare one when pad #1 is in the wash). You don’t want your baby’s pee to soak into the mattress or its seams. We also recommend some light blankets. A few for swaddling, a few to throw on the floor to play on. Additional but not necessary bedding options include dust ruffles and curtains—these are optional decor items. (Never put a curtain near the crib). You definitely don’t need diaper stackers (fancy fabric case for diapers), pillows (can’t use them until about age 3) and thick baby quilts. Wall hangings might be nice for decor but they aren’t necessary. An optional teething rail (shown in the picture at the top of this page) should only be used for older babies who are standing and they should be secured tightly to the crib. In the end, all you really need are sheets and blankets (or wearable blankets). Reviews of 60+ Crib Bedding Manufacturers. Yes, 60+! Hi G! That’s not a brand we’ve reviewed yet. We’ll check it out. I’ve recently bought a few sets by Kushies. They’re super soft! Specially during the warmer months. I’ve been leaning towards the 100% cotton fabrics since they keep and also noticed they don’t get the slight burnt smell I’ve gotten from synthetic materials. Thanks for sharing that Merlion! Glad that worked for you! Any reviews on the Nested Bean sleep sacks? Thanks for checking out our crib bedding recommendations! Thanks too for your question. We haven’t reviewed the Nested Bean Sleep Sack yet, but we did take a look at their web site and ask our resident pediatrician for a quick thought on it. Basically, it’s like most sleep sacks except for the weighted area on the chest. We don’t think this design is any better for your baby and we see no scientific evidence that a weighted chest area promotes deeper or longer sleep. We’d save some money and buy a regular sleep sack from HALO or another brand. I am looking for some infant crib sheets for a bed that is 52 x 36, hoping you can tell me where i can find sheets in this size for a baby/toddler bed. All crib sheets sold in the US must be a standard size to fit US cribs—which are also one size! So you should be good to go by ordering any of our picks above! Best wishes!